Self-unloaders are specialized ships equipped with onboard cargo-handling systems, enabling them to discharge without shore-based unloading equipment. Their rapid discharging rate, and reduced infrastructure and labour requirements, make this bulk cargo handling option an effective and competitive solution that helps keep costs down and minimize environmental impacts. Self-unloaders provide ideal solutions for shipping and handling commodities such as salts, fertilisers, aggregates, coal, grains, ores and minerals. 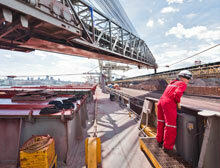 Click here for more information on the types and features of CSL's self-unloading vessels. How does a self-unloader work? Operating 24 hours a day at speeds up of up to 5,000 tonnes per hour, self-unloaders discharge faster than conventional dry-bulk carriers and do not require the expense of stevedores or cleanup crews. Self-Unloaders deliver more useable product than conventional vessels by virtually eliminating waste and contamination. Self-unloaders can operate and discharge cargo in any accessible waterway. They do not require shore-based discharge systems or additional infrastructure. Anywhere from 0 to 70 metres from quayside, self-unloaders can discharge directly into a hopper, a barge, a quay or a warehouse or store. Self-unloaders can provide offshore transhipment operations, topping up or offloading into larger vessels. Self-unloading vessels can reduce a cargo’s overall delivered cost per tonne because they are fast, efficient and less capital and labour intensive than on-shore based systems. The rapid turnaround time associated with self-unloaders frees up congested berths, thus reducing port costs and demurrage. Loading and discharging cargo from a self-unloader can be carried out within a completely enclosed system. This ensures a clean ship and a clean dock, no dust pollution around the harbour and reduced noise levels. Advanced dust suppression equipment and fully enclosed or covered booms on many of our vessels further reduce the potential for dust or spillage. Noise generated by the ship’s self unloading machinery is controlled through the use of acoustic enclosures and sound barriers.